A very quick and popular way to turn well fermented kimchi into a tasty meal! Kimchi-jjigae (김치찌개) is a popular stew-like dish made from kimchi (a national, spicy side dish made from fermented cabbage) and commonly tofu, mushrooms and pork. 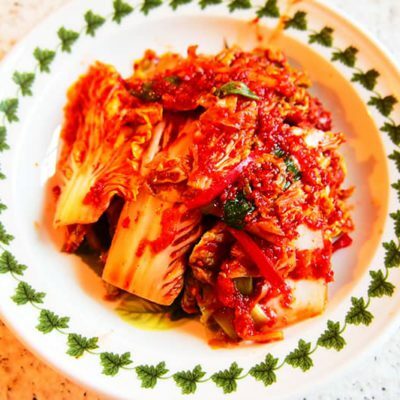 It is best cooked using kimchi that has become too fermented to eat raw as this adds extra flavour and means it can be used without going to waste. It is ideal for me to use bought kimchi in the UK as this is typically imported from Korea and the time taken to import it means it is already quite well fermented before it arrives in my kitchen! Kimchi-jjigae is usually served from the center of the table in one pot alongside an assortment of side dishes and fresh white rice for each person. It’s a nice way to get the family together around the table and the fact that it can be made in just 30 minutes makes it perfect for a mid-week evening meal. Wash the shiitake mushrooms and slice thickly. Slice the tofu into bite sized pieces. Remove the top layer of skin from the belly pork and slice into fairly thin pieces. Heat the vegetable oil in a pan or a clay pot (ttukbaegi / 뚝배기) over a medium heat and add the pork and garlic. Cook until the pork turns golden brown. Add the kimchi along with the kimchi juice and the gochugaru to the pot and continue to cook for a further 60 seconds. Slowly pour in the vegetable stock and bring to the boil. Once boiling add the shiitake mushrooms and tofu, reduce the heat and simmer for 15 minutes. Season with a pinch of salt if required. Slice the spring onion and use as a garnish. Serve in the center of the table alongside fresh white rice.